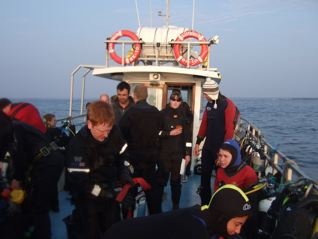 Light winds and a blue sky, heralded the first official club dive out along with a group form Newcastle University Sub Aqua Club on the Farnes in 2009. 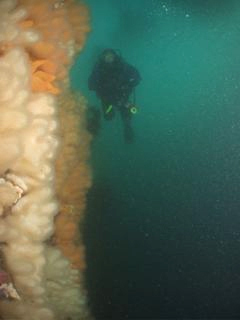 Indeed this dive proved to be an exhilarating fast ride along the wall, with some respite being offered by various nooks and crannies in the reef which offered some shelter from the fierce tide. 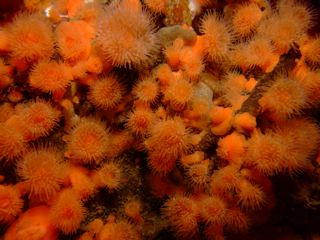 Along the way we encountered areas of bright orange anemones as well as an intriguing fish, a pogue, waiting in ambush amongst some deadman’s fingers. After 40 minutes, the agreed dive time, we headed for the surface and the scattered waters were soon littered by inflated bright orange SMB’s. 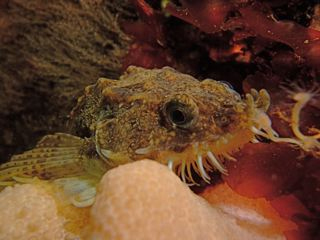 Once everyone was safely back on board the vessel headed further around the Longstone reef to find shelter from the swell and the ebbing tide. 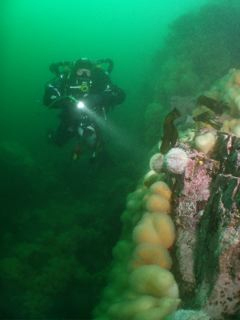 Some of the party also took the opportunity to complete various Dive Leader drills and skills, invigilated by a number of regional instructors along for the dive. With the sun beginning to set, we headed back to Seahouses only to rather embarrassingly discover that there was not enough water in the harbour for the boat to enter! Billy managed to manoeuvre the vessel alongside the south entrance pier. Some of the party opted to climb up the rather ropey ladder and make the long walk along the wall and rough ground back to Seahouses. The remainder opted to swim into the harbour carrying their kit. 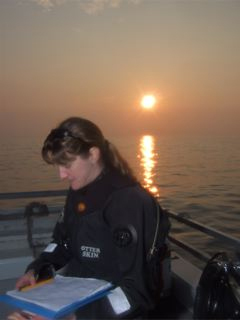 An interesting end to the evenings diving.